Come to Clinic for Vision PC for pediatric eye exams. 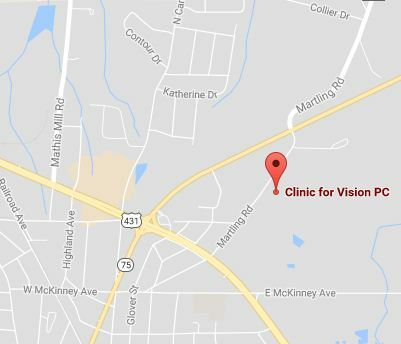 Our eye doctors provide eye exams for children in Albertville, Alabama. Learn how our office creates a pleasant and comfortable atmosphere for your child and how important it is to examine your child's eyes regularly. 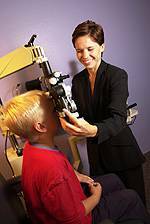 Read more about pediatric eye exams below. Our Optometrist, Dr. Kathryn B McCurdy O.D. uses the Diopsys Nova Vision Testing Systems a state of the art machine that uses EEG to see if there are visual issues such as Amblyopia/lazy eye. This machine tells us what visual information the brain gets and can tell the eye doctor if the two eyes are working together properly. The eye is the "camera" and the brain is the "computer", even when the eyes are functioning properly, if there is an issue with the brain/eye interaction it can cause serious vision problems. Amblyopia is a condition where the brain is not using one of the eyes properly. Because the brain is more flexible as a child detection is crucial early on. 100,000 children per year become blind in one eye because of untreated Amblyopia. For school-aged children, an eye exam every two years if no vision correction is required. Children who need eyeglasses or contact lenses should be examined annually or according to their eye doctor's recommendations. Read more about vision learning. For more information on eye exams and children's vision, visit your eye doctor in Albertville.Our eye doctors are easily accessible if you're in: Guntersville, Hyatt, Douglas, Crossville, Altoona, Geraldine. Understand the important role that vision plays in a child's ability to read and learn in school.